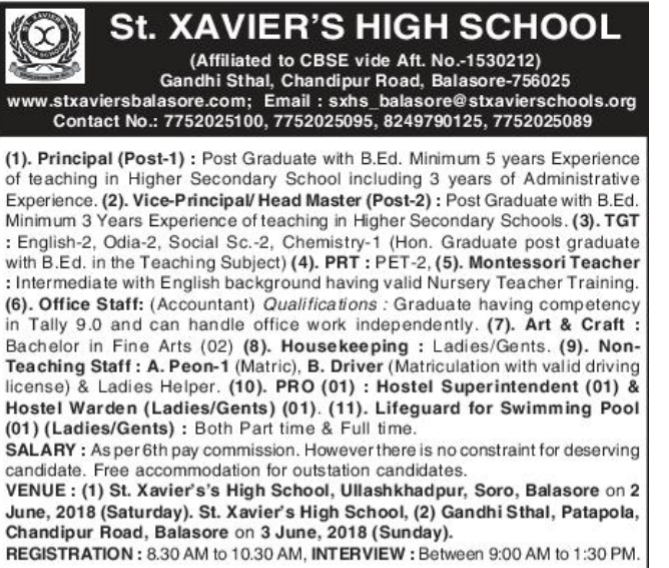 St.Xavier's High School Group, Balasore has advertised in THE Samaja newspaper for recruitment of Principal, Vice Principal, PRT/TGT/PGT jobs vacancies. Interested and eligible job aspirants are requested to attend interview on 3rd June 2018 .Check out further more details below. 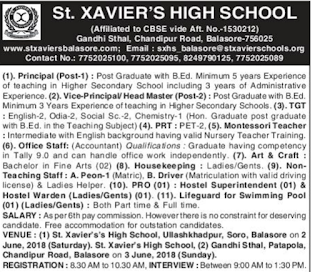 About School:ST. XAVIER'S HIGH SCHOOL BALASORE, Opportunities aren't made, they are St.Xavier's high school made With the aim to provide quality education for a better India, St.Xavier's high school was started in the year 2005. Right from the time of inception, St.Xavier's high school has achieved tremendous growth in terms of reaching large number of people and also in delivering value based education. Located on Balasore, the friendly campus. St.Xavier's high school caters all the educational facilities.